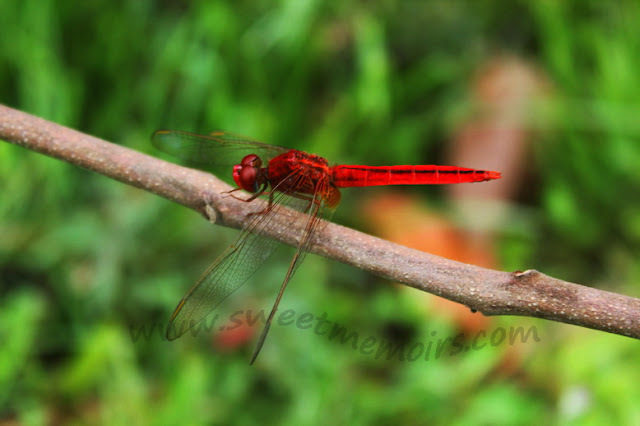 Beautiful red dragonfly! The color is so vivid! beautiful Che, I don't get to see many dragonflies here, but ours here are mostly of the brownish orange hues, would love to see this one too. My Ruby Tuesday, would love it if you can visit. Oh my gosh...I've never seen one such a vivid, bright-colored red like this. What a treat for us visitors. I'd really like to have you stop by if you can. Have a wonderful day ahead. Gorgeous shot! Please visit my Ruby Tuesday here. My Ruby Tuesday post, hope you can come and visit.